The two principal cornerstones of radiation protection of a patient are optimization and justification of the medical exposure. Much is still needed in the area of Justification in the day to day practices in Hospitals and clinics through the world to ensure these two principles are met. In the old BSS, the role of Justification was described as the referring physician’s role while in the new BSS defines the role to involve more than just the referring physician including the radiologist for consultation for appropriate justification. To understand Justification completely and how it works it is important to review the three level’s and how they fit into the BSS. Level 1 which is the Justification of the use of radiation in medicine which is covered in the BSS in paragraph 3.154 describes the most general level of believing that radiation in medicine is accepted as doing better than harm and that the benefits outweigh the risk. Level 2 is the Justification of the defined radiological procedure. This is dealt with in the BSS in paragraph 3.155 and is defined to include the Health Authorities in conjunction with national professional bodies to determine the specific evidence-based guidelines and appropriateness criteria for different radiological procedures. These guidelines should be reviewed as new technology advances. Level 3 is the Justification of the procedure for the individual patient. This is defined in the BSS under paragraphs 3.156 and 3.157 is the application of the procedure to the individual patient is justified in order to perform the medical exposure. These two requirements of the BSS ensure that the individual medical exposure is justified in advance taking into account the specific objectives of the exposure and the characteristics of the individual involved. Particularly this third level is where active participation of each member of the healthcare team will share a different aspect of responsibility for justification process. The second and third levels of justification are a common part of the everyday operations of hospitals and clinic medical imaging departments. In the new BSS Justification in general is delegated to a member of the imaging team specifically the radiological medical practitioner (radiologist) but it is important to understand that the entire Healthcare team contributes to both level two and level three to ensure Justification happens effectively and that good communication through a team approach will produce the best method for success. Each member of the health team (referring physician, radiologist and technologist/radiographer) can use their resources including evidence-based guideline, appropriate use criteria, and departmental protocols to assist them in their process of Justification and Authorisation. While a referring physician may use appropriateness criteria to request a study which they understand has the lowest radiation dose a Radiology Department may use referral guidelines in a very different manner. The imaging team comprising the radiologist, rad.technologist/radiographer, and the medical physicist will use appropriate criteria and guidelines that are developed with a strong evidence base to build their protocols for each diagnosis for a specific disease process which is the responsibility of the lead radiologist. While each member has a distinctive role; the radiologist providing the input to the clinical referral guidelines; the radiographer/technologist is providing image acquisition protocols of the relevant imaging modality and the physicist providing information on how to achieve the best image with the lowest dose achievable to obtain a high-quality image with input from for the radiologist to read reads the image. This practice of producing protocols needs to be audited as new technology become available or updates on software of equipment is released to ensure the highest image quality to the patient which in turn contributes to the radiation protection. The radiological medical practitioner (radiologist or in some countries a radiographer/technologist working in accordance with guidelines issued by the radiological medical practitioner) serves as the gatekeeper for the imaging department but this depends heavily on all members of the imaging departments healthcare team to do their part in the protection of radiation exposure to the patient. Without the team approach, many aspects of the protection of the patient can be missed. It is unlikely in common day practice that a radiologist can see all requests for justification and authorization before the patient is exposed to radiation. It is more common than not that the technologist/radiographer will bring the requests to the attention of the radiologist when the request is not appropriate because of missing information or when the patients' history doesn’t support the request for imaging. There are some common areas that requests for imaging are protocoled for appropriateness before the exposure is made i.e. CT and MRI are two modalities where this is common practice but for all the other procedures this may not happen and it is therefore, in cases of concern, the technologist/radiographer has a duty of care to review the justification criteria before the exposure is undertaken. Thus using a team approach. When following this practice radiographers/technologists will bring their concerns to the attention of a radiologist or a radiographer/technologist who has been delegated the task of justification and authorisation according to an agreed protocol which may be the case is some countries. 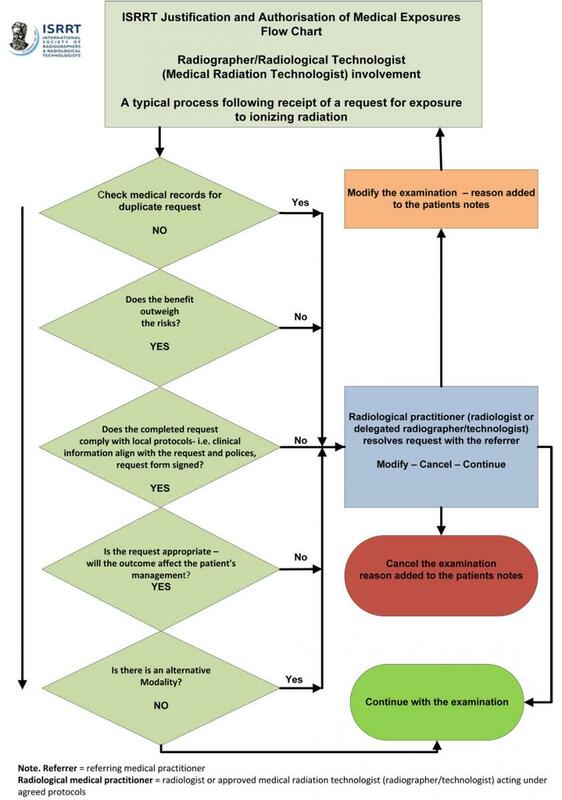 The discussion then must take place between the referring medical practitioner and the radiological medical practitioner to resolve the matter which may end result in the request being modified to a more appropriate procedure or the request being canceled with the reasons documented in the patient’s notes or the examination continues to be performed. One may ask why we are making our member aware of this important team approach to justification and authorization. There are many reasons why imaging requests for procedures using radiation are ordered inappropriately by referring physicians. World Wide peer review studies published information showing that referring physician ordering procedures underestimate patient radiation exposures often and this can contribute to the overuse and increase in public’s exposure to ionizing radiation. This study proved that a worldwide knowledge deficit exists among physician and physician trainee about patient exposure to ionizing radiation from nuclear medicine studies. The study also demonstrated that this same lack of knowledge also existed as well in CT procedures. The study concluded that physician that are ordering these procedures and are underestimating patient exposures can be contributing to the overall increase in public radiation exposure over the past decades which in turn contribute to cancer risk in general. It was suggested that algorithms could aid physician with more education regarding patient radiation exposure with perhaps evidence-based appropriate use criteria might reduce exposure rates to the public. Interestingly a similar outcome was discovered in a related peer review study on referring physician’s knowledge on medical exposures in diagnostic imaging in Africa where the author found of the 151 referring physicians at a university-affiliated hospital in Cameroon the concepts of “useful exam and Justified exam were not known by 113 or 78.8% and 95 practitioners. Also interesting was the fact that MRI was selected as irradiating by 62 or 41.1% and SPECT and PET scan as non-radiation examinations by 98 or 64.9% and 115or 76.1% of the participants. Only 11 clinicians knew the terminology of Justification and Optimization and limitations to radiation protection. The conclusion of the study was “The knowledge of physician on radiating medical procedures and justification of requests for these procedures is inadequate. Training in radiation protection and the introduction of guideline for the proper use of imaging test could improve physician’s justification of radiating examinations. 3, “Referring Physicians’ Knowledge on Justification of Medical Exposure in Diagnostic Imaging in a Sub-Saharan African Country, Cameroon. Moifo, B., et al. (2014) Open Journal of Radiology, 3, 60-68. As can be seen peer review studies worldwide demonstrated a lack of knowledge on radiation exposure in all of the medical imaging modalities as cited above. The need for more education in the principle of radiation protection in the form of Justification and Optimization is needed worldwide. Until the education and training for referring physicians is brought up to an acceptable level a team approach is essential with each member of the healthcare team contributing to the overall justification process. This best practice will produce the best outcome for the patient in healthcare today in relation to radiation protection. While different countries have varying regulations the overall concept can be incorporated with all countries. For instance, in countries where a radiologist is in every hospital and clinic the concept of referring physician consulting with the radiologist can be incorporated into the justification process. For those countries that don’t have a radiologist in every clinic or hospital and where it applies with regulator processes, the Authorization may be carried out by either the practitioner or a radiographer (medical radiation technologist ref. BSS) working to the guidelines issued by the medical radiation practitioner. In some countries, the radiographer/technologist acts as the practitioner for different radiological procedures so in these countries the radiographer/technologist can help with the consultation process using a departmental adopted protocol. Countries where the radiologist isn’t present in the hospital or even the country and when images are being reviewed using Telemedicine the radiographer/technologist play a vital role in the role of justification and authorisation. 1. Malone, J., Guleria, R., Craven, C., Horton, P., Järvinen, H., et al. (2012) Justification of Diagnostic Medical Exposures: Some Practical Issues. Report of an International Atomic Energy Agency Consultation. British Journal of Radiology, 85, 523-538. 2. Physician Knowledge of Nuclear Medicine Radiation Exposure RADIOLOGIC TECHNOLOGY, November/December 2013, Volume 85, Number 2. 3. Moifo, B., et al. (2014) Referring Physicians’ Knowledge on Justification of Medical Exposure in Diagnostic Imaging in a Sub-Saharan African Country, Cameroon. Open Journal of Radiology, 4, 60-68.